I’ll jump at the chance to give myself a good pampering. What better way to do that than go to a skin clinic and get yourself a face massage? A facial massage is beneficial because it has two main purposes – first, it helps to relax the facial muscles that can be tense after a particularly long and stressful period; and more importantly, it keeps the skin looking young and healthy. There is nothing to stop you from getting a regular facial massages when you have your own facial oil at hand. 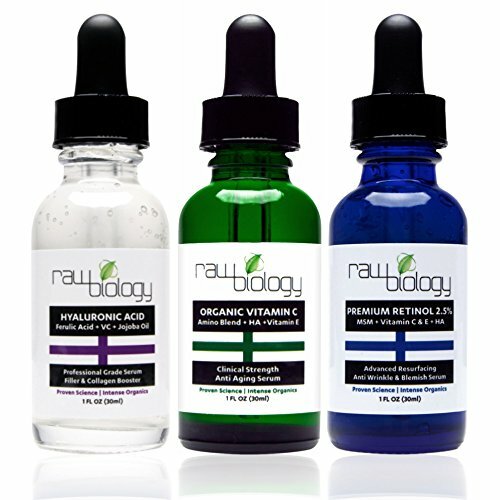 Treat yourself to unlimited face massages when you have Raw Biology Organic Liquid Facelift at home! Raw Biology Organic Liquid Facelift offers a lot of benefits that will keep purchasers satisfied and wanting more. First of all, this facial oil is composed of ingredients that are organic and all natural. The facial oil contains no chemicals that can be harmful or cause irritation to the skin. For those who are into natural products, this is a product that one can find an instant liking to. Also, it should be noted that this is a product made of premium ingredients that are composed of vitamin C, vitamin E, MSM, jojoba oil, hyaluronic acid, retinol, and ferulic and amino acids. There is so much that can be taken from a small bottle of this facial oil. With all the many ingredients packed into one small bottle, this product can surely offer a variety of benefits to its users. First on the line of these many skin benefits is the award-winning anti-aging system that can counter the appearance and number of fine lines and wrinkles. Premature skin aging is most common these days because of the environment, food intake, and the many stressors that surround everyone. With this facial oil, premature skin aging can be avoided if the product is regularly used. Another wonderful effect of using this facial oil is it evens out the skin tone in the face. It also helps to repair and heal scar tissues so that a young and glowing face can be achieved. To add, this particular facial oil also helps in giving the skin a soft feel. It also aids in making the skin look and feel firm. One only needs to use this facial oil regularly, either as a separate product or as a means of performing a facial massage, in order to feel the many skin benefits. Finally, it is should also be noted that this facial oil is made in the USA. Local producers and manufacturers will be supported with the purchase of this facial oil. Raw Biology Organic Liquid Facelift offers a lot of skin benefits, with anti-aging properties being in the lead, but it cannot be said that this facial oil is without its disadvantages that have been reported through verified purchasers and other customer feedback. There are certain things about the facial oil that interested purchasers should know before buying it. There are some reports that the facial oil may cause some irritation on some skin types after a few months of use, but complaints of this nature were rare and sporadic. Another issue with the facial oil is its price, as some may find it a little too pricey for its type and class. To add, the price of the facial oil also increases as time goes by, so this could be an issue for those who only have a limited budget for the purchase of a facial oil like this. Raw Biology Organic Liquid Facelift is not all praises and advantages, but all things considered, this is one product that offers quite a number of skin benefits that cannot be found in other facial oil brands. One issue about the facial oil is its high price. However, when one has to consider all the benefits that the facial oil can offer, the price is just a small thing to pay for a quality product.